Following the four Trillion RMB fiscal stimulus in 2009, People's Bank of China tightened up its M2 supply. Kaiji Chen, Jue Ren and Zha Tao from Emory University and Federal Reserve Bank of Atlanta explored how the banks reacted to the tightening of M2 supply by expanding shadow banking activities, and how the rapid growth of shadow banking in turn hampers the effectiveness of monetary policy. In the aftermath of the unprecedented stimulus of four trillion RMBs injected into the economy by the Chinese government to combat the 2008 financial crisis, the People's Bank of China (PBC) pursued contractionary monetary policy by tightening M2 supply between 2009 and 2015. This policy resulted in a simultaneous decrease in bank deposits and bank loans. 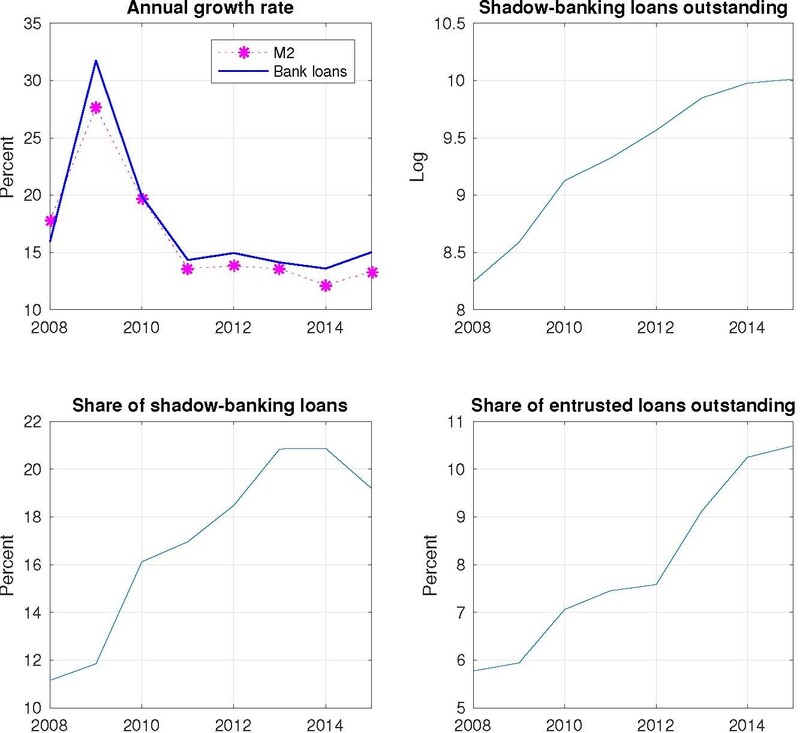 In the meantime, there was a rapid increase in shadow banking loans and their share in total bank credit (Figure 1). Accordingly, despite a sharp drop in bank loans, total new credit increased by an average rate of 4.2% during the same period. The ratio of non-financial private credit to GDP rose from around 150% in 2009 to more than 200% in 2015. This credit boom has caused great concern about China's financial risks not only to China's domestic policy makers but also to those from international organizations (e.g. IMF and OECD). Note: The share of shadow banking loans is the ratio of shadow banking loans to the sum of shadow banking loans and bank loans. The share of entrusted loans is the ratio of entrusted loans to the sum of entrusted loans and bank loans. Entrusted loans are the most important component of shadow banking loans. At the core of this divergence between total credit and bank loans is the interaction between China's monetary and regulatory policies. Most existing studies however, explore the role of these two policies separately. For example, the seminal work by Kashyap and Stein (2000) examined the effect of contractionary U.S. monetary policy on lending by liquidity-constrained banks. More recently, Acharya, Schnabl, and Suarez (2013) examined the effect of capital regulation changes on the growth of shadow banking by capital-constrained banks. In the context of China, there is growing literature on shadow banking (see, for example, He, Lu, and Ongena, 2015, Allen et al., 2015 and Hachem and Song, 2016), none of which, however, address its interaction with monetary policy. In a recent paper (Chen, Ren, and Zha, 2017), we take the first step in exploring the nexus of China’s monetary and regulatory policies against the backdrop of rising shadow banking. Specifically, we address three questions: (1) how China's monetary policy interacted with banking regulations to affect the banking system; (2) how China's banking system reacted to monetary policy tightening by exploiting shadow banking products and by adding these risky products into its balance sheets; and (3) how the rapid rise of shadow banking hampered the effectiveness of monetary policy on the banking system. Although our analyses are specific to China, their broad policy implications help to shed light on the interactions between monetary and regulatory policies and between shadow banking and traditional banking in the U.S. and other developed economies. With M2 growth as a policy instrument, China's quantity-based monetary policy works through the bank lending channel with two key China-specific banking regulations. The first, which we call the Loan Deposit Ratio (LDR) regulation, is the legal ceiling on the ratio of bank loans to bank deposits imposed by the PBC on each commercial bank; the second, which we call the safe-loan regulation, is the regulation issued by the Chinese Banking Regulatory Commission (CBRC) prohibiting commercial banks from expanding bank loans to risky industries such as those suffering from overcapacity. This bank lending channel is crucial for understanding the observed sharp drop in the growth of bank loans following the monetary contraction. At the end of 2009, the PBC began to tighten M2 supply out of fear of a bank credit overexpansion during the 2008 financial crisis. As M2 growth continued to slow, banks became more vulnerable to sudden and unexpected deposit withdrawals, which exposed them to the risk of violating the LDR regulation. To meet unexpected deposit shortfalls against the LDR ceiling, banks attracted additional deposits by offering a much higher price than the official deposit rate imposed by the PBC (called "chong shi dian" in Chinese). Such high prices during the last-minute rush decreased the net return on bank loans and caused sharp decrease in new bank loans. To quantify this bank lending channel, we explicitly model the quantity-based monetary policy system in China, which features an endogenous-switching rule. Our estimated endogenous monetary policy tracks the series of actual M2 growth rates very closely (Figure 2). This allows us to isolate the effects of exogenous changes in monetary policy on the banking sector. Note: "ARIX share" is the ratio of ARIX holdings to the sum of ARIX holdings and bank loans on the balance sheets of the 16 publicly listed commercial banks. Source: WIND and authors’ own calculation from Chen, Ren, and Zha (2017). Entrusted loans are a major force behind the rapid increase in shadow banking. From 2009 to 2015, entrusted loans became the second-largest financing source of loans after traditional bank loans, and their share in total outstanding shadow banking lending reached over 49% in 2015. On paper, entrusted loans are off banks' balance sheets because they are lending activities between non-financial firms with commercial banks or non-bank financial companies acting as trustees. Our empirical findings nevertheless suggest that non-state banks bought back the beneficiary rights of entrusted lending that they facilitated and put them in the asset category called "account receivable investment" (ARIX) on their balance sheets. Across non-state banks, the correlation between new entrusted loans and the increase of ARIX during the period of 2009–2015 was as high as 0.6. 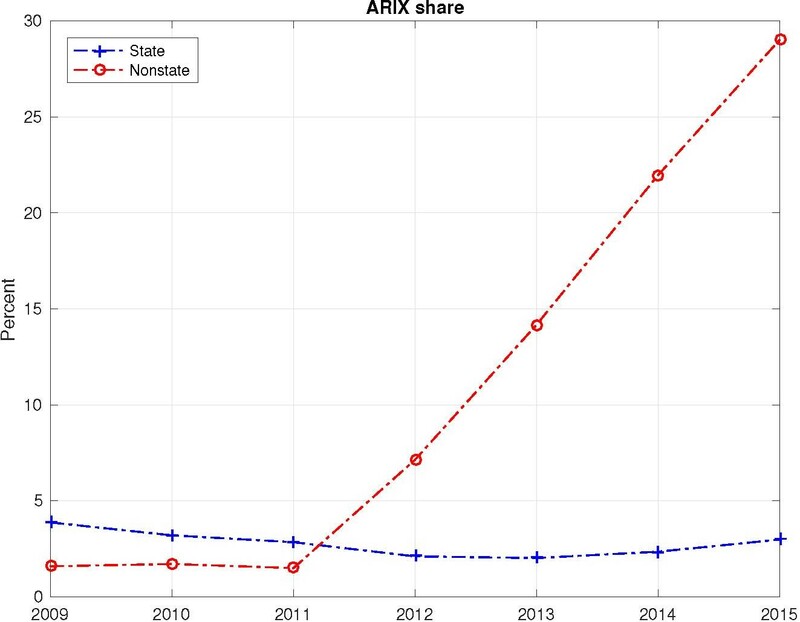 Moreover, the share of ARIX in non-state banks' assets increased rapidly during this period to almost 30% in 2015 (Figure 3). For state banks, by contrast, this correlation is insignificantly different from zero and the corresponding ARIX share is essentially flat throughout the period. Note: Top panel: annual M2 growth rates and estimated endogenous monetary policy. The gap between the actual M2 growth path and the endogenous policy path represents exogenous M2 growth. 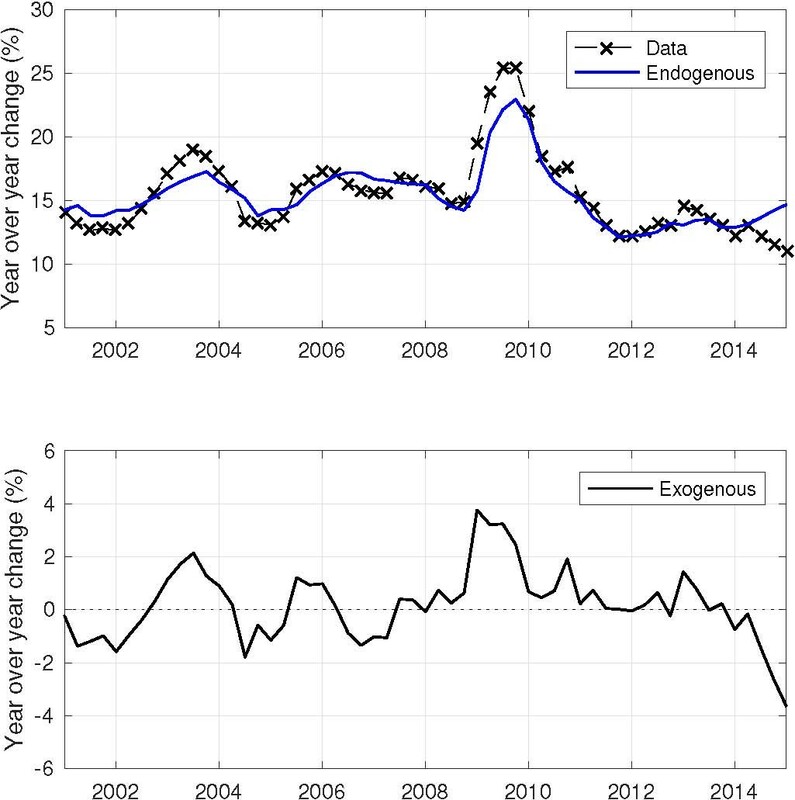 Bottom panel: exogenous M2 growth. What incentives do non-state banks — but not state banks — have to exploit shadow banking products and bring these risky products into their balance sheets in response to monetary contraction? To address this question, we construct a simple theory of banks' optimal portfolio choice. The theory builds on Bianchi and Bigio (2014), but takes into account China's unique safe-loan and LDR regulations. One key theoretical prediction is that contractionary monetary policy encourages non-state banks to invest more in risky assets to recoup the losses from deposit withdrawals. Shadow banking products provide a convenient vehicle for their risk-taking while circumventing the LDR and safe-loan regulations. ( We find that more than 60% of entrusted loans were channeled into real estate and industries with overcapacity, which enjoy the Chinese government's implicit guarantee.) On the other hand, state banks, owned and controlled directly by the government, do not operate against the government's own regulatory policies.  We construct two micro datasets at the level of individual banks to test the aforementioned hypotheses. Using an identification scheme similar to Jiménez et al. (2014), our estimation indicates that a one percentage point decline in M2 growth increased the amount of entrusted lending intermediated by non-state banks by 10.65% and their ARIX by 37.69%. The corresponding effects of monetary contraction for state banks are either insignificant or negative. Therefore, both our theory and empirical evidence suggest that it is the interaction between monetary tightening and regulatory restrictions that led non-state banks to take excessive risks through shadow banking. This regulatory arbitrage hampered the effectiveness of monetary policy on total bank credit. We build this argument by both theoretical model simulation and empirical estimation. After extending our theory to a dynamic setting with bank equity and calibrating it to China's economy, we found that in response to a one-standard-deviation fall of M2 growth, banks' risky assets rise and more than offset the decline of bank loans, which leads to an increase in total bank credit (Figure 4). Our simulated impulse responses closely match their empirical counterparts obtained using panel VAR regression. Thus, the rise of shadow banking activity marginalized the effectiveness of monetary policy tightening on total bank credit. What regulatory remedy would make the bank lending channel of the quantity-based monetary policy more effective? Both our counterfactual empirical and theoretical analyses suggest that when restrictions on banks' risky investment assets are imposed, total bank credit declines in response to monetary tightening (Figure 5). 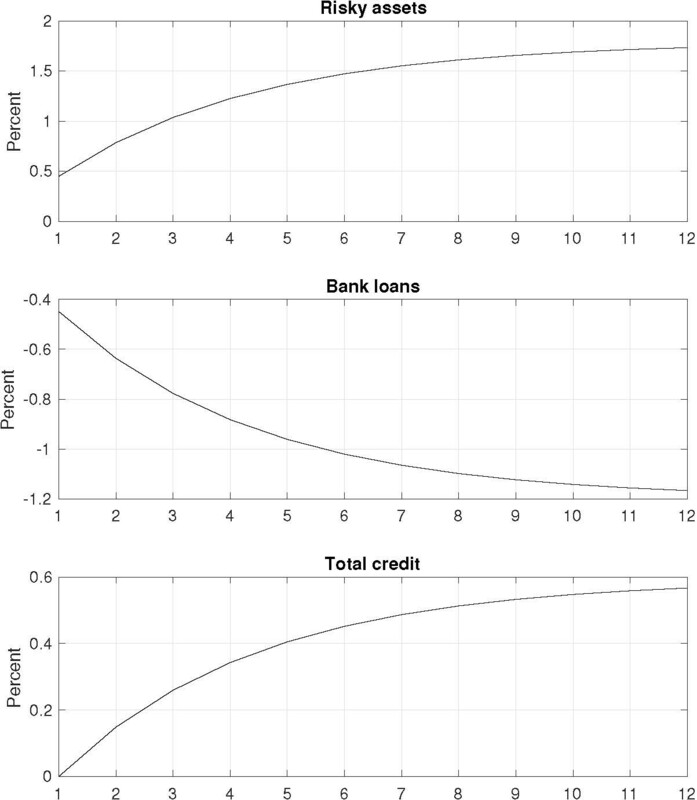 This suggests that restricting the growth of individual banks' total credit, instead of bank loans alone, helps to restore the effectiveness of quantity-based monetary policy on total bank credit via the bank lending channel. Note: The left panel reports the counterfactual path from the restricted panel VAR (dotted circle line) along with the .68 probability bands from the original panel VAR (dashed lines). The right panel displays the counterfactual path simulated from the theoretical model. A recent series of regulatory policy changes in China bear the same spirit as our counterfactual experiments. Since the beginning of 2016, the PBC has established the macro prudential assessment (MPA) system to coordinate its conduct of monetary policy. A salient feature of the MPA is the requirement that the "broad credit" growth rate should not deviate from the targeted growth rate of M2 by more than 22%. In October 2016, the PBC further incorporated those assets financed by wealth management products into the measure of broad credit. More comprehensive reforms would require simultaneous changes in monetary and regulatory policies for their better coordination. As Brunnermeier, Sockin, and Xiong (2017a and b) point out, in financial development, it is important for the government to account for the private incentives of market participants to front-run government policies. Thus, the design and implementation of various monetary and regulatory policy reforms require taking into full account private agents' expectations about future government policies and their corresponding reactions. This remains an important topic for future research. 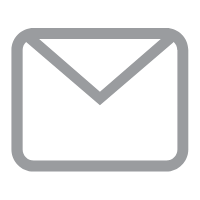 Authors' note: The views expressed herein are those of the authors and do not necessarily reflect the views of the Federal Reserve Bank of Atlanta or the Federal Reserve System. Acharya, Viral V., Philipp Schnabl, and Gustavo Suarez (2013), "Securitization without Risk Transfer," Journal of Financial Economics, 107, 515–536. Allen, Franklin, Yiming Qian, Guoqian Tu, and Frank Yu (2015), "Entrusted Loans, A Close Look at China's Shadow Banking System," Manuscript, University of Pennsylvania. Bianchi, Javier and Saki Bigio (2014), "Banks, Liquidity Management and Monetary Policy," Federal Reserve Bank of Minneapolis Research Department Staff Report 503. Brunnermeier, Markus K., Michael Sockin, and Wei Xiong (2017a), "China's Gradualistic Economic Approach and Financial Markets," forthcoming, American Economic Review. Brunnermeier, Markus, K., Michael Sockin, and Wei Xiong (2017b), "China's Model of Managing the Financial System," Manuscript, Princeton University. Chen, Kaiji, Jue Ren, and Tao Zha (2017), "The Nexus of Monetary Policy and Shadow Banking in China," NBER Working Paper, No. 23377. Hachem, Kinda and Zheng Song (2016), "Liquidity Regulation and Unintended Financial Transformation in China," NBER Working Paper No. 21880. He, Qing, Liping Lu, and Steven Ongena (2015), "Who Gains from Credit Granted Between Firms? Evidence from Inter-corporate Loan Announcements Made in China," Bank of Finland Discussion Paper 1. Jiménez Gabriel, Steven Ongena, José Louis Peydró, and Jesús Saurina (2014), "Hazardous Times for Monetary Policy: What do Twenty-three Million Loans Say About the Impact of Monetary Policy on Credit Risk-Taking?," Econometrica, 82(2), 463–505. Kashyap, Anil K., and Jeremy C. Stein. 2000. "What Do A Million Observations on Banks Say About the Transmission of Monetary Policy?" American Economic Review 90 (June): 407–428.